Look, we've got enough problems as it is with walking corpses rising from the grave and trying to eat us. Last thing we need is someone crawling out of the ground a week after the fact just because they were really, really drunk. Our friends at Oobject have 12 of the best safety coffins money can buy. And when you're done "digging through" this list, check out these spectacular sewers, 12 awesome tunnels and the Ikea of the the Damned. 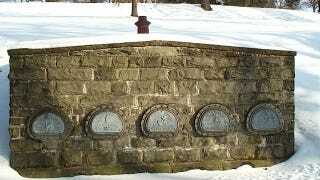 "In 1937, at the age of 83, he was buried in the vault in Williamsport's Wildwood Cemetery, which resembles a large pizza oven with five metal doors. Pursell was entombed, McGyver-like, with a board or two, an ax, a hammer and a piece of bread." "as the members are springy any attempt to pull down the rod will only cause the teeth to be more firmly embedded in it The object of this arrangement is to prevent the victim in the coffin from pulling down the rod and closing the air ports in case he should in his paroxysms of agony incident to his discovery of his condition grasp the valve rod"
"My invention has relation to that class of devices for indicating life in persons buried under doubt of being in a trance in which connection is obtained between the person in 25 the grave and an indicator oh the ground over the grave through a casing or tube leading from the surface of the ground down to the coffin"
"I have devised an improved coffin permits the body to be kept daring a time until decomposition sets in and moreover enables the person inclosed in the to give warning if there has been a mistake"
"If the person buried in a state of trance opens his eyes on returning to consciousness he sees light through the glass disks of the lid and will on coming to his senses unconsciously make a movement by which the mechanism which stands under the pressure of the springs is immediately released and the springing up of the lid is effected The sick person can tints raise himself he receives"
A bizarrely over-complicated device that involves a popup fan. 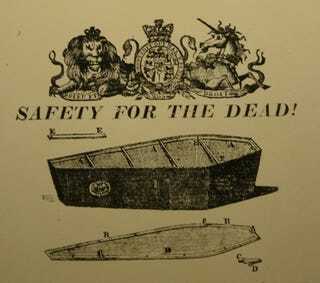 "The object of my invention is to provide a means whereby the supposed cadaver buried before life is extinct on regaining animation may sound an alarm through the annunciator located at the superintendent's office or other suitable place by which a signal of life may be imparted and also immediate rescue rendered to the recuperating body by means of fresh air until the said body is disinterred and medical aid summoned"
"invention consists a peculiarly constructed torpedo adapted to be readily secured to the coffin and the body of the contained corpse in such manner any attempt to remove the body after burial will cause the discharge of the cartridge contained in the torpedo and injury or death the desecrator of the grave"
"should the person laid in the coffin on returning life desire to ascend from the coffin and the grave to the surface h6 can do so by means of the ladder H but if too weak to ascend by the ladder he can pull the cord in his hand and ring the bell I giving the desired alarm for help"